ChessBase, created by Fredenc Friedel and Matthias Wullenweber of West Germany and distributed in the United States by Sci-Sys of Torrance, California, is a revolutionary tool for chess enthusiasts of all levels. Essentially, ChessBase is an interactive graphic database for storing and reviewing chess games. With it, you can examine complete chess games--those of world champions, famous players, your opponents, or yourself--and replay them interactively onscreen. Chess players can therefore use ChessBase to enjoy the games of others without clumsy books and chess pieces, and to improve their own play and results by studying games en masse in a systematic way. World chess champion Garry Kasparov of the Soviet Union was an early and enthusiastic supporter of ChessBase, and he used it to defeat a team of Swiss international masters 5 1/2 -- 1/2 in a simultaneous exhibition last year, and the top six American junior players 4-2 this February. By collecting the games of his potential opponents and entering them into ChessBase, he was able to familiarize himself with their playing styles and opening repertoires after only a few hours, instead of taking days poring over chess books. Kasparov has even commercially endorsed the program (an unusual action for a Soviet sportsman), saying in a recent advertisement that ChessBase is "the greatest development in chess study since the invention of the printing press!" Other users include American star Michael Rohde and Grand Masters Korchnoi and Miles, former Soviet and British champions. ChessBase is fairly easy to use, since it's GEMbased, although it's important that you study the manual carefully before using the program. ChessBase itself is on disk, but uses a "dongle" plugged into the cartridge port for copy protection. Also included is a 570K RAMdisk program--it's necessary for floppy disk users, since ChessBase spends much of its time accessing its database files. If you have a 520 ST without a memory upgrade, there's a 50K RAMdisk also included. ChessBase stores chess games in databases, which consist of four files with the extensions .GMF (game file), .GMI (game index), .KEY (opening key), and .POS (opening positions); all four files must exist for a database to be used. To get new users started, a collection of about 1000 recent games from international tournaments is provided on the ChessBase master disk. Studying with ChessBase is a four-step process. First, you select the database you want to use (you cannot switch databases without quitting the program and running it again). Second, you decide what you are interested in reviewing, such as all the games of one tournament, all the games in a particular opening variation, or all the games of a certain player. Third, you search the database for those games, using the "List & Select" entry in the Games menu to bring up a dialog box where you specify the players, year, and opening information. Finally, you load the games found by the search into memory and review them, using the arrow keys to go forward and backward through the moves of each game. As you study a game, you can save one position to a buffer, move the pieces around with the mouse and then retrieve the saved position to continue the game. The score of the game is displayed in international figurine algebraic notation, in which language-specific letters like K (king) and N (knight) are replaced by characters in the shapes of chess pieces (though you can customize these to whatever symbols you like). There are two ways to add games to a database. You can enter new ones by moving piece icons on your screen's chessboard, or you can merge them from existing databases, although this is somewhat cumbersome. You must open the database from which you want to take games, select the ones you want, save them to a special export database (extensions .EXF and .EXI), quit the program, open the database into which you want to put the games and use the Import option to insert them. This is not intolerable, since you can merge two complete databases by simply changing the extensions from .GMF and .GMI to .EXF and .EXI and do an import as usual. ChessBase organizes databases according to an opening key--a tree of commonly arising positions considered as branchpoints. Any pair of key files (.KEY and .POS) can be combined with any pair of game files, and the resulting database can be reclassified automatically so that each game is attached to the position farthest down in the tree that occurs in the game. This might seem complicated, but it means you can request all the games in the Sicilian Defense, Dragon Variation and see them immediately. Besides the supplied popular key, which consists mainly of well-known opening names, classifications such as the Encyclopedia of Chess Openings system are available. At presstime START received a beta copy of ChessBase II, due July 1st. The graphic handling has been improved; an intelligent input procedure lets you click on a piece or square and have ChessBase figure out a move of that piece or to that square. You can now enter annotated "lines" (variations) on the board; lines can be nested to any depth so that a stored game can be a complex tree rather than a linear string of moves. File access speed has been increased, and search parameters of the databases now allow wildcards. Many of Chris Chabris's complaints were addressed; you may now access any database without leaving the program. The program also now uses the standard GEM file selector so that complete subdirectories are displayed. ChessBase II requires a megabyte of memory and still sells for $229.95; the upgrade price for ChessBase owners has not been set, although it should be between $20 and $50. ChessBase's user interface also includes many thoughtful safeguards against data loss. For example, before you can use the Delete Many function, you must start an export file to contain the games that are removed from the database, so that in case you make a mistake you can recover the lost data. Also, when you quit the program, a list of files that were modified is provided, perhaps reminding you to copy them to more permanent media from the RAMdisk if you are using it. annotate them, save them to disk and print them out. On the downside, ChessBase is almost as easy to misuse as it is to use, and displays some of the "rough edges" often found on European software. Subdirectories are left out of displayed pathnames and the screen is often redrawn improperly or not at all after a dialog box disappears. A text-only screen with a seemingly out of place two-entry menu is used for selecting games and key variations, making for uncomfortable transitions between it and the main chessboard display. The chess piece icons themselves could also use a little touching up. ChessBase also works only in monochrome, and there are no indications that it will be available for color systems in the future. Three minor limitations of ChessBase stand out as especially annoying. 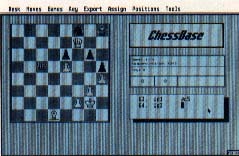 Although you can enter games with the mouse and onscreen chessboard, with the separate Leonardo chess computer connected to the serial port and by keyboard using computer algebraic notation, the two most popular forms of notation, short algebraic (Nd5) and descriptive (NQ5) are not supported, making it virtually impossible to type games in directly from printed scores. 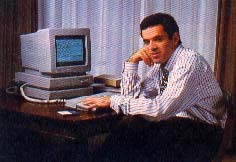 Furthermore, since annotations to a move are limited to 255 characters and only a single game can be written out to an ASCII text file at a time, producing newsletters and tournament bulletins remains a chore: the program guards against illegal moves appearing in the score, but helps with little else. But perhaps the main drawback of ChessBase is its inability to merge two or more keys into one. For example, I purchased the entire New In Chess (NIC) Yearbook series on disks in ChessBase format, but each disk's 600K database contained the games from a different set of openings, and each had its own key for those openings only. I wanted to create one giant NIC database on my hard disk, but I couldn't combine the separate opening keys into a single pair of .KEY and .POS files. The 71-page ChessBase manual is written in an easy-to-read, humorous style with important notes and helpful hints separated from the text and boxed for easy recognition. Many screen shots and diagrams are provided, including illustrations of the file formats used by the databases. Although there are a table of contents and four helpful appendices, including a reasonable glossary, there is no index. If you have a question about using ChessBase that the manual doesn't answer, you can contact Saitek for technical support. Also, the follow-on products available for ChessBase are superb. In addition to the NIC senes published by Inter-Chess of the Netherlands, ChessBase's authors publish several specialized collections, such as classic tournaments and world championship matches, as well as a bimonthly disk magazine including tournament results, opening analysis by British grandmasterJohn Nunn, and a set of a thousand games. According to the manual, they would like to publish	databases and keys of general interest created by users as well. ChessBase may not be all that World Champion Kasparov	says it is, but his is a powerful endorsement of a (dare I say?) revolutionary program. Although the program isn't perfect, Friedel and Wullenweber seem genuinely dedicated to supporting it and fixing its bugs. ChessBase makes chess easy to study today, and with improvement can become a model of	the way computers will be used tomorrow. Chris Chabris is a student at Harvard University whose specialties range from playing chess to exploring artificial intelligence. ChessBase, $229.95; starter program (demonstrates ChessBase), $49.75; additional opening classification systems, $19; game disks $19 each; one year subscription to	ChessBase magazine (six disks), $89; ChessBase with three additional databases and subscription, $299. Distributed by Saitek, 2301 West 205th Street, Suite 108, Torrance, CA 90501 (213) 212-5412. For additional technical support, call (818) 799-7567.